Q. How long can I leave flowers on my loved one's plot for the Memorial Day holiday? A. Flowers and tributes can be placed on the gravesites a week before Memorial Day and must be removed 10 days following Memorial Day. This ensures that our grounds keeper can keep the grass trimmed and the cemetery looking its best. Q. Will I have access to water for fresh flowers? A. Greenwood Cemetery provides water access during the Memorial Day holiday and throughout most of the summer, however, water is not guaranteed every day. There are spigots in various locations throughout the cemetery to make water available and convenient to all who come to remember their loved ones. Q. Who takes care of the grounds and are they accessible during the winter season? A. Groundskeeping is contracted out to Derek Feldman, who regularly mows and maintains the grounds of Greenwood Cemetery. During the winter, cemetery roads are not plowed, except in the case of an internment service or by special request. Q. How can I help do my part to take care of Greenwood Cemetery? A. 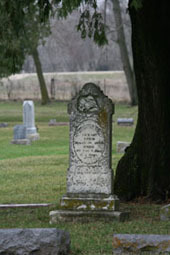 Donations are greatly appreciated and needed for continual upkeep, maintenance and beautification of the cemetery. Please consider remembering us in your will or making a gift to help us provide the best place of rest for your loved ones. If interested in making a donation, contact Dave Edson at (641) 435-2408. Q. What is being done about graves that settle with time? A. Our groundskeeper constantly tries to fill in graves that are settled, however it is an ongoing process. If you are concerned about a settled plot, please contact Dave Edson at (641) 435-2408. Q. Does Greenwood Cemetery have any annual traditions? A. Memorial Day services are held every other year in Greenwood Cemetery, on an alternating schedule with the other local cemetery in Nashua. We take pride in honoring our country's veterans, including the large number of Civil War soldiers and military personnel from other wars who are buried on our cemetery grounds. The next Memorial Day service to be held in Greenwood Cemetery will be Monday, May 28, 2012.